Last June, I was in Washington, D.C. for a short series of meetings. I had some free time before one of those meetings and I decided to squeeze in a little sightseeing. When I realized how easy it is to take the Metro (subway) to Arlington National Cemetery, my mind was set. Next stop, Arlington. To my knowledge, I don’t have any relatives buried at Arlington. Still, simply walking the grounds is a sobering and humbling experience. 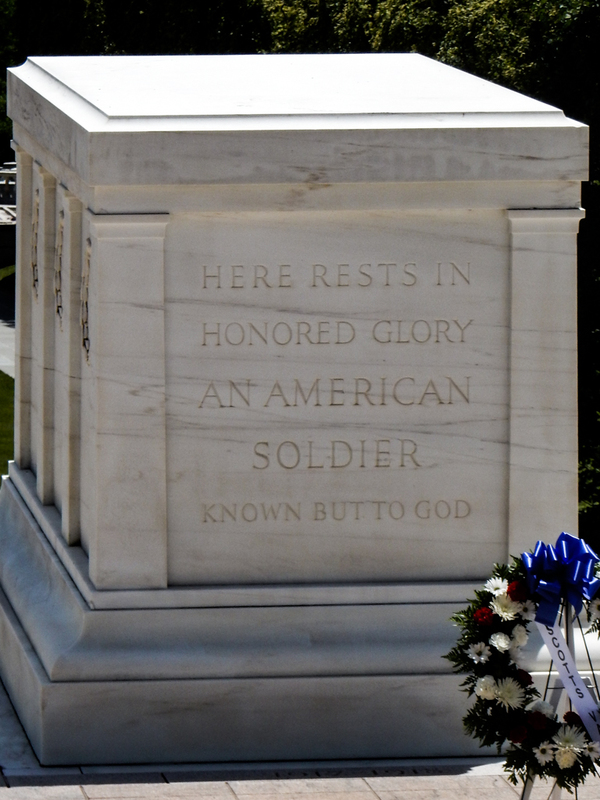 Visiting the Tomb of the Unknown Soldier is especially moving. Staring over the vast number of graves – men and women who served, many who died while protecting our freedom – one cannot help but think about how very lucky we are. The cemetery was crowded, and people were moving slowly. That was fine by me. I enjoyed looking at some of the section markers and, as is typical for Washington, DC, it was hot and humid, so a slow pace was perfect. It seems selfish to feel like you’re suffering when standing among so many graves, but summer weather in DC brings you to that point. I’m not going to extend this in support of a political or social agenda. I’m just going to say that I was impressed with the lesson this woman was teaching her children. I hope we can take this woman’s message to heart today. I hope we can give some thought, and offer a few prayers for the brave men and women who died fighting for us, and the families they left behind. I hope we can also reflect on the many freedoms they fought for. In memory of our heroic dead of WW II-Who shall be forever young. Well done, Dan. Well done indeed. Hugs. Thanks Teagan. I appreciate the hugs. Hallowed ground for sure. I’ve been to Arlington a couple of times, and it is always a humbling experience. Each stone has an individual story, but they all have one thing in common and that is they made the ultimate sacrifice on our behalf. Our flag can’t fly high enough to express our appreciation on Memorial Day. Thanks Judy. I love that last sentence. You’re so right. I’ll gladly take the day off, but I’ll think of these people during the day. Sorry, Dan, having trouble with words today. I have often said that everyone should visit Arlington National Cemetery at least once in their lives to grasp the history, honor and legacy of those who have died fighting for this country, and all of us so fortunate to live in America. I have been several times, but the most memorable was when I attended the funeral of the father of one of my employees. His Dad was killed in Viet Nam and was listed as Missing in Action for over thirty years until his remains were identified through DNA testing. I had the honor of attending his father’s burial ceremony in the chapel at Arlington National Cemetery, and walking behind the flag-draped caisson to his final resting place. It was absolutely one of the most moving events of my life, and drove home the importance of honoring each and every individual that died fighting for this country, and thanking God that we were not lying there with them. I can only try to imagine how moving that ceremony was. Standing in that place of honor was very special. That’s an incredibly moving story, Dan. Made me teary. War cemeteries are sobering places. The most moving for me were those at Gallipoli. So many young boys who didn’t really understand what they were getting into and let down by those in charge. Thanks. I feel that way about our Civil War battlefields. Thanks! I’ll have to add that to the list of places I should visit. Only pure white marble outside of Colorado. I was just looking at their website. It’s on the list for sure. They have a short movie of the making of the tomb. Fascinating. Ooops… if you’re in western New England, a great stop. The story of the mother and her child was wonderful! I figured you hit “reply” too soon. I think I would enjoy touring that museum. Wonderful, Dan. I’ve been to Arlington (although not quite as crowded) and it is indeed sobering. The number of graves is overwhelming and a reminder of how our soldiers fought, won and maintain the freedom for this melting pot of a country. I would recommend a visit to anyone going to D.C. to truly experience what photos can’t convey. Thanks for this post and Happy Memorial Day. Thanks Mary. Bring surrounded by so many examples of selflessness is truly humbling. Our daily complaints pale by comparison. A beautiful and moving tribute to our Heroes Dan! The story of the mom and her children is wonderful! It’s been many years since I visited Arlington National Cemetery. I’ll never forget how moved I was at the Tomb of the Unknown Soldier. Never Forget! Thank you Deborah. Standing at that tomb, looking out over a sea of graves, you just can’t help but feel blessed and lucky. Salute to the fallen soldiers! Arlington National Cemetery is a place which will stay in my memory for ever. We didn’t speak a word. The experience is overwhelming. Thank you for visiting there, and here, today. In spite of some of my deeper feelings regarding war, I agree that it is a very humbling experience to walk through Arlington National Cemetery. But I am humbled walking through any cemetery and reading the epitaphs. I often winder how many unsung heroes there are, or were in the world. Cemeteries are special places. I enjoy, perhaps that isn’t the right word, walking through old cemeteries as well as those where my relatives are resting. Arlington is unique in that so many of those people died fighting for our freedom. PS. These soldiers fought not only for the freedoms of this country but for those of the world, people they don’t even know. That’s true sacrifice. That’s a very good point, Cheryl. Thank you for adding that. Dan, great post today. Love the photos as well. Beautiful, Dan. You said a lot for those of us who have a family member in Arlington. Thank you. I always make time to go Arlington when I’m in DC. It’s just so moving. It really is a special place to visit. Thanks for the comment. I’ve only been to Washington once for just a few days and Arlington was on the agenda. Although all cemeteries are special place, Arlington certainly stands well over and above. This was a touching visit, Dan, that reminded me of the emotion I felt while walking through that cemetery on a very hot summer afternoon. Thanks Joanne. It is a very special place. I’m glad you enjoyed reading this. Thank you for the comment. What a lovely woman. I support her decision. Thank you for this, Dan. Thank you for sharing this Dan….very poignant!! We are a very blessed country and tend to take it for granted. My heartfelt thanks to all those that fought and died for our country…you are remembered! A touching post, Dan. The American ideals of life, liberty and the pursuit of happiness are worth fighting for. My heart goes out to all those who lost their lives in standing for those principles. Thank you. It’s worth reflecting on the price that has been paid. Thank you! I know that name well. It’s fitting that he is honored in that way. As much as I (and millions of others) dream of a world at peace, some wars have to be fought to protect democracy and populations from crazy dictators and other power-thirsty dirigeants. We also took our children to Arlington years ago. The kids were still young and my son didn’t understand why there were so many tombs and flags. But he understood the significance through the silence that most people respect when visiting Arlington. Not sure I was as eloquent as the mom you describe. But my son was phsyically moved when we stopped at the Tomb of the Unknown Soldier. A year later we visited the Unknown Soldier buried under the Arc de Triumph in Paris. For some reason these tombs are the most meaningful to me. I think those are the most meaningful, because they speak to the selflessness of their sacrifice. Not only do we not know who they are, but for each of them, there’s a family that never knew the true fate of their loved ones. Thanks for visiting and adding your thoughts. That was a lovely, lovely story Dan and your thoughts about it were lovely as well. Thank you for sharing it on Memorial Day and helping me to pause and reflect. I’m glad you enjoyed it, Janet. It happened last June and I left myself so many reminders to post it for Memorial Day. I was sure that I’d forget. My mom and her Dad are both there. It brings me a lot of comfort to know that they’re in such a sacred place. Her ashes are within sight of the Washington Monument, where we used to fly kites when I was a kid. It’s really beautiful there. Thank you for adding this comment and I thank them for their service/sacrifice. It is such a beautiful place. Yes, to thank them. What a wonderful lesson to teach a kid. Loved this post– sorry I’d missed it earlier–thankyou for pointing it out to me. Thanks Damyanti. Part of the message is to remind people that immigrants understand the value of this country. So many people buried in that cemetery were first generation born in America in their family.